First, download and install WebUpdater. Once installed, connect your device to your PC and run WebUpdater. It will help you download and install software updates on your device. WebUpdater updates most products, excluding Palm and Pocket PC devices, fixed-mount marine devices, chartplotters, fishfinders and certain discontinued devices we no longer support. For security reasons, you should also check out the Garmin WebUpdater download at LO4D.com which includes virus and malware tests. Additional screenshots of this application download may be available, too. 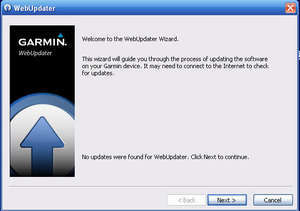 Garmin WebUpdater download been highly rated by our users.